52º Pitching Wedge Compare with the best classic wedge designs such as Cleveland’s® Golf 900 Form Forged Gun Metal Wedges at $129.00 each! This new matching wedge set features great playability and a classic Satin finish. Looks great and plays like a winner! Specifications: Built with high quality stepped steel shaft with a low to mid kick point resulting in a slightly higher ball trajectory. Soft Grips featuring an ultra soft compound that is firm enough to prevent twisting for a great feel in your hands. Semi U Grooves. Perfect for golfers of all skill levels who are trying to shoot lower scores – especially in the short game. For more details about the Professional Open Series 690 Classic Satin Finish, click here. Set of four matching wedges in lofts of 52, 56, 60 and 64º Compare with the best classic wedge designs such as Cleveland’s® Golf 900 Form Forged Gun Metal Wedges at $129.00 each! This new matching wedge set features great playability and a classic Satin finish. Looks great and plays like a winner! Specifications: Built with high quality stepped steel shaft with a low to mid kick point resulting in a slightly higher ball trajectory. Soft Grips featuring an ultra soft compound that is firm enough to prevent twisting for a great feel in your hands. Semi U Grooves. Perfect for golfers of all skill levels who are trying to shoot lower scores – especially in the short game. Available in both right hand and left hand versions For more details about the Professional Open Series 690 Satin Finish, click here. Compare with the best classic wedge designs such as Cleveland’s® Golf 900 Form Forged Gun Metal Wedges at $129.00 each! This new wedge features great playability and a non-glare black finish! Looks great and plays like a winner! Specifications: Built with high quality stepped steel shaft with a low to mid kick point. Soft Grips featuring an ultra soft compound that is firm enough to prevent twisting for a great feel in your hands. Heat treated in black milonite for a unique, non-glare finish and a slightly softer feel. Black milonite is extremely durable and will provide many years of quality play. Perfect for golfers of all skill levels who are trying to shoot lower scores – especially in the short game For more details about the Interloper PO 690 Black 64º Extra Lofted Wedge, click here. Compare with the best classic wedge designs such as Cleveland’s® Golf 900 Form Forged Gun Metal Wedges at $129.00 each! This new wedge features great playability and a non-glare black finish! Looks great and plays like a winner! Specifications: Built with high quality stepped steel shaft with a low to mid kick point. Soft Grips featuring an ultra soft compound that is firm enough to prevent twisting for a great feel in your hands. Heat treated in black milonite for a unique, non-glare finish and a slightly softer feel. Black milonite is extremely durable and will provide many years of quality play. Perfect for golfers of all skill levels who are trying to shoot lower scores – especially in the short game For more details about the Interloper PO 690 Black 60º Lob Wedge, click here. Compare with the best classic wedge designs such as Cleveland’s® Golf 900 Form Forged Gun Metal Wedges at $129.00 each! This new wedge features great playability and a non-glare black finish! Looks great and plays like a winner! Specifications: Built with high quality stepped steel shaft with a low to mid kick point. Soft Grips featuring an ultra soft compound that is firm enough to prevent twisting for a great feel in your hands. Heat treated in black milonite for a unique, non-glare finish and a slightly softer feel. Black milonite is extremely durable and will provide many years of quality play. Perfect for golfers of all skill levels who are trying to shoot lower scores – especially in the short game For more details about the Interloper PO 690 Black 52º Sand Wedge, click here. Compare with the best classic wedge designs such as Cleveland’s® Golf 900 Form Forged Gun Metal Wedges at $129.00 each! This new wedge features great playability and a non-glare black finish! Looks great and plays like a winner! Specifications: Built with high quality stepped steel shaft with a low to mid kick point. Soft Grips featuring an ultra soft compound that is firm enough to prevent twisting for a great feel in your hands. Heat treated in black milonite for a unique, non-glare finish and a slightly softer feel. Black milonite is extremely durable and will provide many years of quality play. Perfect for golfers of all skill levels who are trying to shoot lower scores – especially in the short game For more details about the Interloper PO 690 Black 52º Pitching Wedge, click here. Compare with the best classic wedge designs such as Cleveland’s® Golf 900 Form Forged Gun Metal Wedges at $129.00 each! For less than one Cleveland Wedge, you get a set of four PO 690 wedges. The PO 690 wedges feature great playability and a non-glare black finish! Looks great and plays like a winner! Specifications: Set of 4 wedges in lofts of 52, 56, 60 and 64º Built with high quality stepped steel shaft with a low to mid kick point. Standard Soft Grips featuring an ultra soft compound that is firm enough to prevent twisting for a great feel in your hands. Heat treated in black milonite for a unique, non-glare finish and a slightly softer feel. Black milonite is extremely durable and will provide many years of quality play. Semi U groove Perfect for golfers of all skill levels who are trying to shoot lower scores – especially in the short game. For more details about the Interloper PO 690 Black Set of four Black Wedges, click here. Features: Great looking irons with a conventional look and advanced game improvement features. While it does feature a moderate topline, reduced offset and classic profile at address, the secret is in the sole and rear cavity mass stabilizing bar. Enhanced perimeter weighting and wider, thicker sole focuses weight where it is needed for most golfers to experience a higher ball flight, a more solid feel and with precision accuracy. Comes fitted with Apollo standard stepped steel shaft and soft velvet grip. Individual irons. You can buy a single iron or two or three to get comfortable with and then build a whole set or buy a complete set right away. Customization: We can customize the shaft flex, length, type and grips. If you have customization requirements, feel free tocontact us. For more information about the Power Play System Q2 Irons, click here. Compare features, performance, and price with Adams® Tight Lies at $199 each. Why Buy the Adams Tight Lies when you can get the Synchron II for a fraction of the price. You’ll like these woods. Material: 17-4 stainless steel Finish: Silver Bulge x roll: 12″ x 12″ Choice of eight lofts Features: Synchron II Fairway Woods are one of our most popular woods of all time because of their proven ease of play. These woods feature a shallow face, which lowers the center of gravity for improved trajectory and playability. Our exclusive rail design allows a clean shot even in thick rough. Stronger lofts help carry distance. Other Characteristics: Choice of Shafts to match your swing. The default is the Apollo Ultralight Shadow graphite shaft but you can choose a different shaft if you like. See detailed section on Shafts below. Regular black wrap grip. Perfect for golfers of all skill levels. 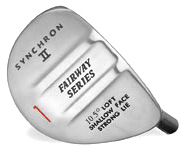 For more information about the Synchron II Fairway Woods, click here. Come fitted with a graphite shaft – ladies flex Power Play has extended the “Quad-Port” weighting technology of its System Q Driver to its System Q Hybrid Irons. The “Tri-port” weighting system not only allows for a lower deeper center of gravity and increased MOI (moment-of-inertia), but the three interchangeable weighted screws can be configured to encourage straight, draw, or fade trajectory. The System Q Hybrid will enable you to customize your ball flight for greater accuracy and directional control. Comes fitted with the Acer Velocity graphite shaft – a 66 gram lightweight shaft designed for a higher ball flight. Better ball flight, better clubhead speed, forgiveness on off center hits, customizable head for draw, fade or straight, senior flex – all put together will help you enjoy the great game of golf. For more information about the Power Play System Q Hybrid Clubs, click here.